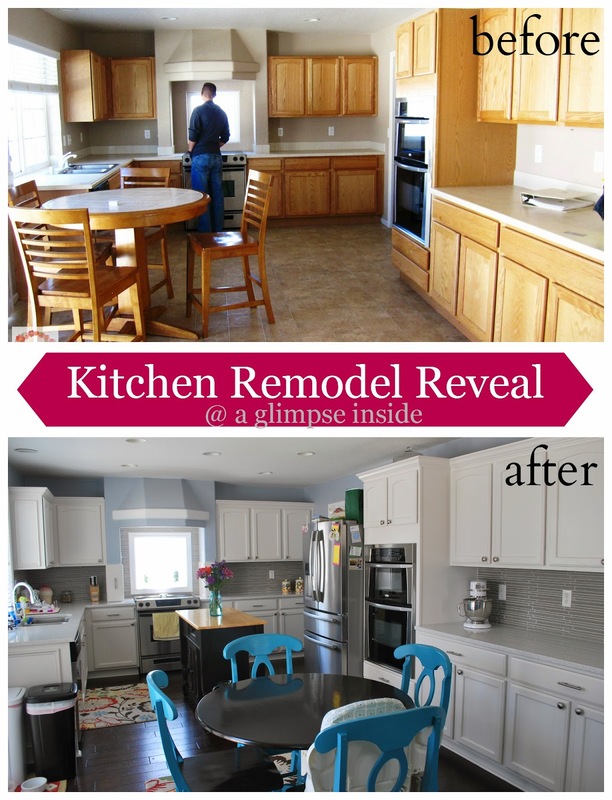 You guys, I am so excited to finally share our kitchen remodel with you all! We started our kitchen last summer, LAST SUMMER PEOPLE! A year ago the 14th to be exact. The majority of it was done quickly but there were two items I had to wait awhile on to be complete. One got finished right after Miss S was born and the other item JUST got completed a week ago. If you follow me on Instagram, you have gotten glimpses of our kitchen since it was started a year ago. Are you ready to see our kitchen? This is a pretty picture heavy post so warning! I am going to go back to the very beginning and break down everything we did, found, and added to our kitchen. 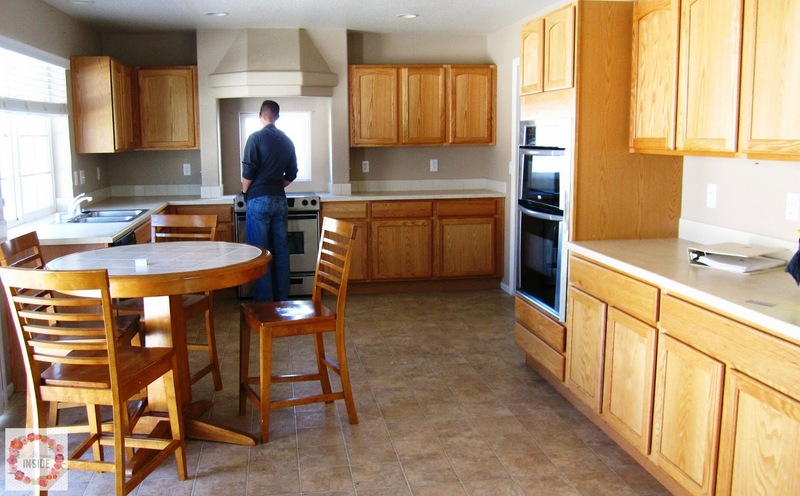 This is what our kitchen looked like when we bought the house. 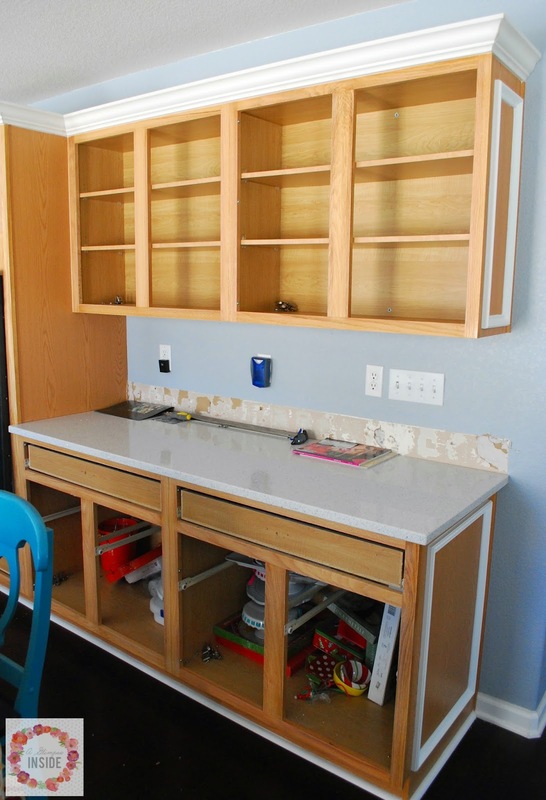 Box store cabinets in that glorious orange finish, linoleum floors, laminate counters. The floors were ripped out as soon as we closed and replaced with the dark hardwood floors we put down throughout the first floor which then made our cabinets even oranger looking. When we decided to replace our counters and start our kitchen, it was cheaper if we took off the counters and old tile back splash ourselves. And in that process we found this little gem. The wall next to our store that comes down from the vent hood area, just hovering above the counters. Which made for an interesting time and I will get into that here in a few. So out with the old counters and everything prepped for the new. 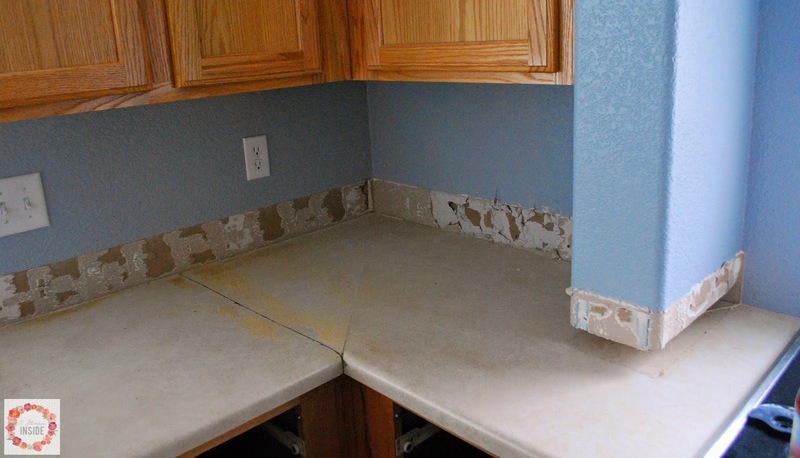 We bought new Quartz counter tops from Home Depot. The name of them is "Stellar Snow" and I love them. They have little mirror like flakes in them so they catch the light. We searched around and got a few bids on counters before we decided to go with Home Depot. We looked at Lowes, and a few local kitchen places around town and we decided to go with Home Depot because we could get a free under mount sink, and they were also having a sale on the quartz at the time. Next came getting our cabinets painted. Since I was pretty pregnant, I didn't want to tackle this ourselves so again, we got a few bids from a few different companies and talked about our options. 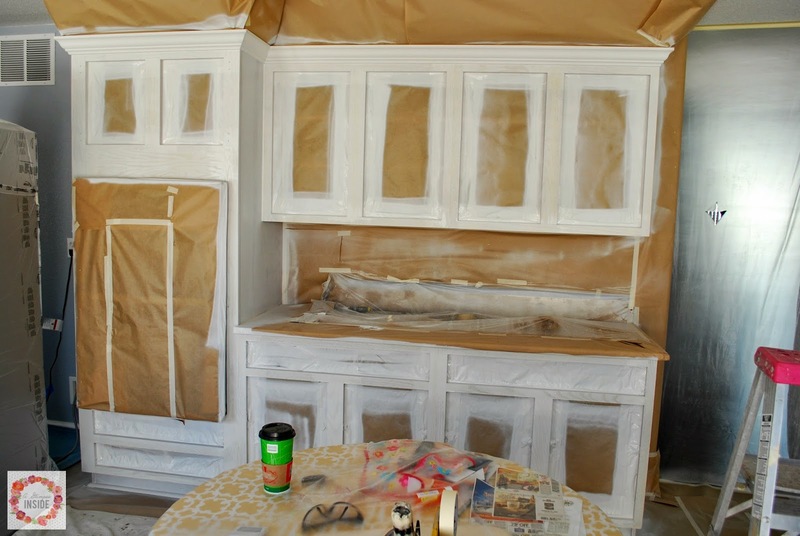 This is what the sides of our cabinets looked like before we got the cabinets painted. I wanted to add some detail so when we were talking to companies we were asking if they could apply anything but we found out it was much cheaper if we did it ourselves. So we got to work a few days before the painters came to add some detail. We added molding to the sides to create boxes for a little something extra. 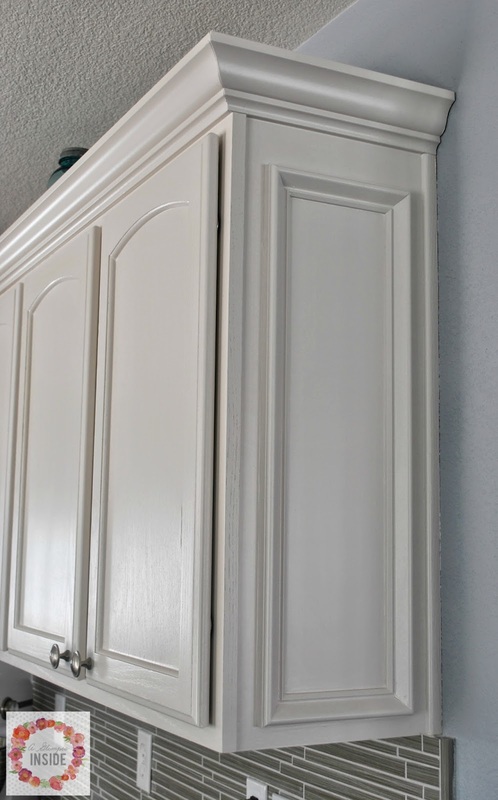 Then added crown molding on top of the cabinets to dress them up a bit and not just plain box store cabinets. And can't forget that we then sanded and caulked around all of it. Then it was time for the painters to take over! They came one day and took all the doors and drawer fronts to take to their shop to spray them. They also sanded and cleaned the boxes and put something on them so it would accept the paint better. The day the painters came to paint the boxes, they taped off everything, covered all the appliances, and even blocked off the area from the rest of the house. They then gave the boxes a couple coats of primer and let them dry overnight. They came back the next day and did a couple coats of the final paint color. A few days later, the doors and drawer fronts were brought back and reinstalled. We bought the paint at Sherwin Williams. It looks white but it is actually an off white color... can't think of the name. I will have to look at the can of paint we have left and let you know. We didn't have any handles on the cabinets before so we knew we wanted to add some. 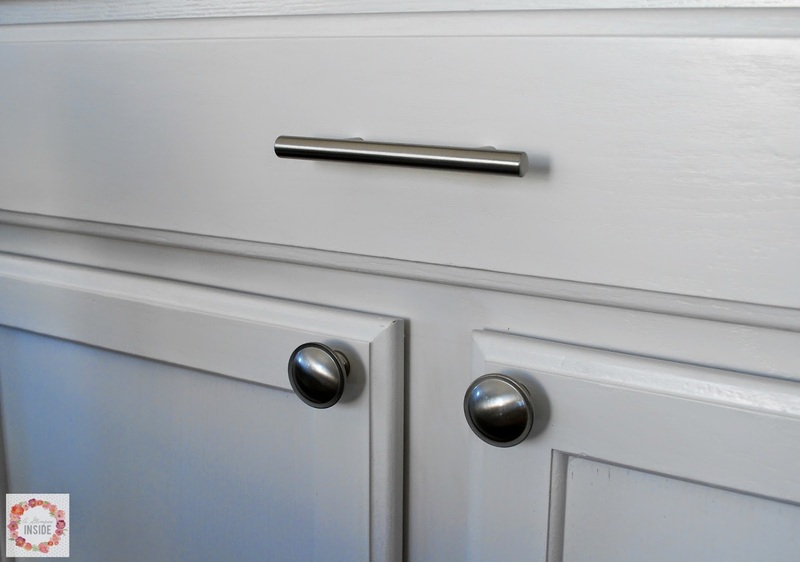 We also found the drawer pulls and knobs at Home Depot. Then the rest of the kitchen remodel was up to us. Ok... now lets go back to those crazy walls that were hovering above our counters for a minute. When they came out to measure our counter tops, the guy was a little stumped at the walls. For some odd reason, we thought the wall went down through the counters and were sitting on the cabinet bases. No sure why he or we thought that. 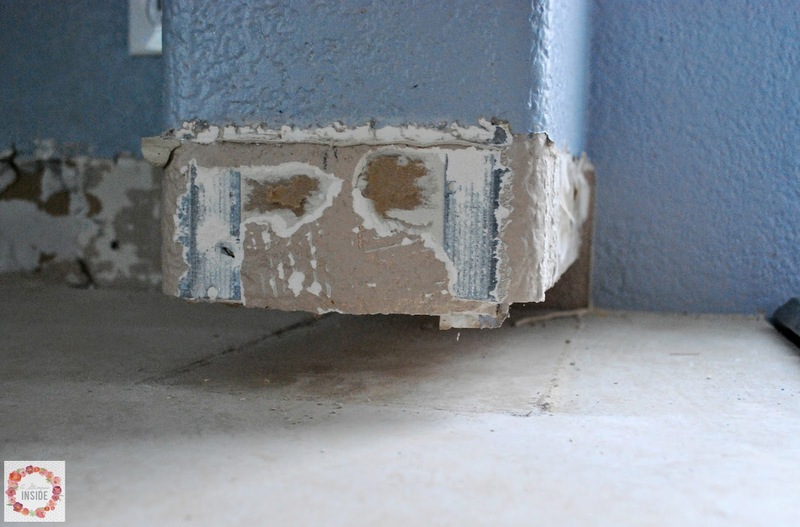 So he measured to the walls and said that they would either cut the counter on site to fit around the wall or precute them and have them trim on site. He then told me what day they would come to do the install and it was like 2 1/2- 3 weeks away. SOOO, like 2 days after the guy came to measure, Travis removed the tile back splash and we found that the walls didn't go through the counters. 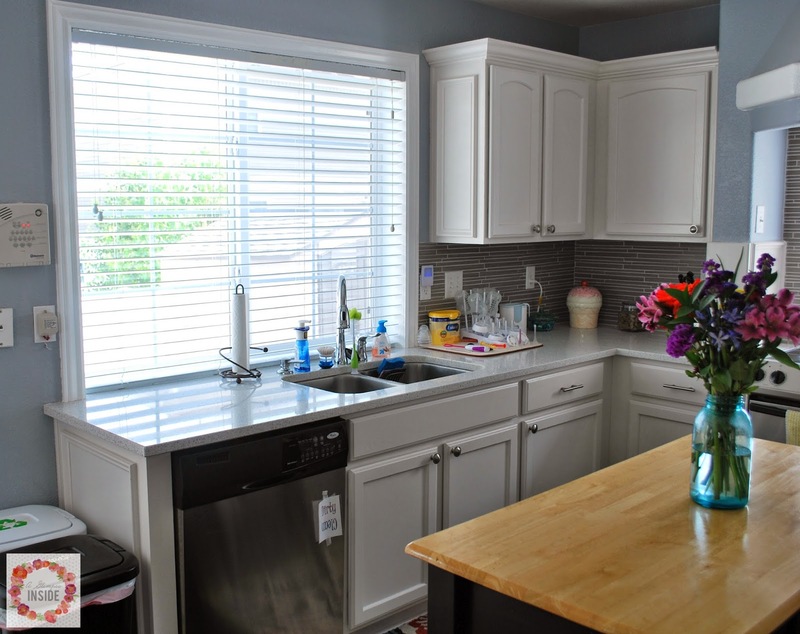 We were so excited because we wanted to just cut off those walls and leave it wide open so he quickly called the install lady he talked to the day before and she was going to contact the installer and let them know NOT to do anything to the counters when they actually cut them. A little bit later, he got a call back from the lady and she told us that they ALREADY cut the counters AND they cut the holes!!! Well CRAP!! Now we had to figure out what the heck we were going to do now. I was mad they already cut them since they weren't being installed for another 2 weeks... we should have had them recut them... all well. SOOOOO... back to the picture above. As you can see, we decided to STILL cut the walls off to be even with the bottom of the cabinets. We had to move two switches in the walls up, one on the left for the vent and one on the right for the lights above the stove. Travis then built boxes to cover the holes. 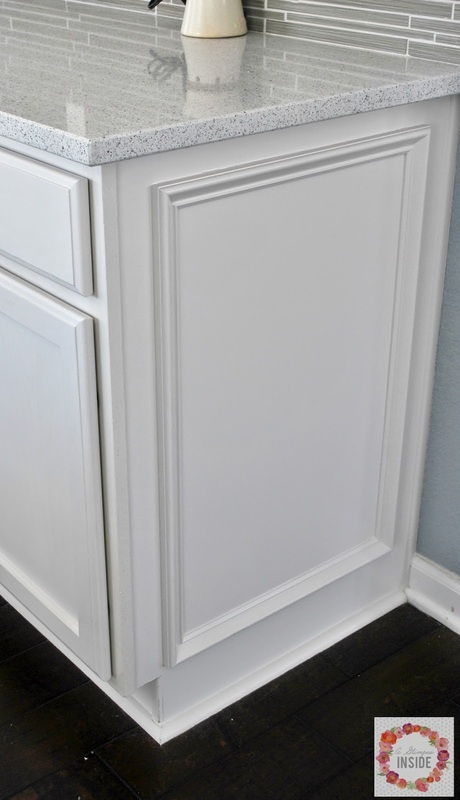 We added molding on the sides to match what we added to the other cabinets. And then these sat... until last week! I will show you the finished product here in a bit. We framed in the window in front of the sink and the one above the stove. And painted them bright white like the rest of the molding in our house. 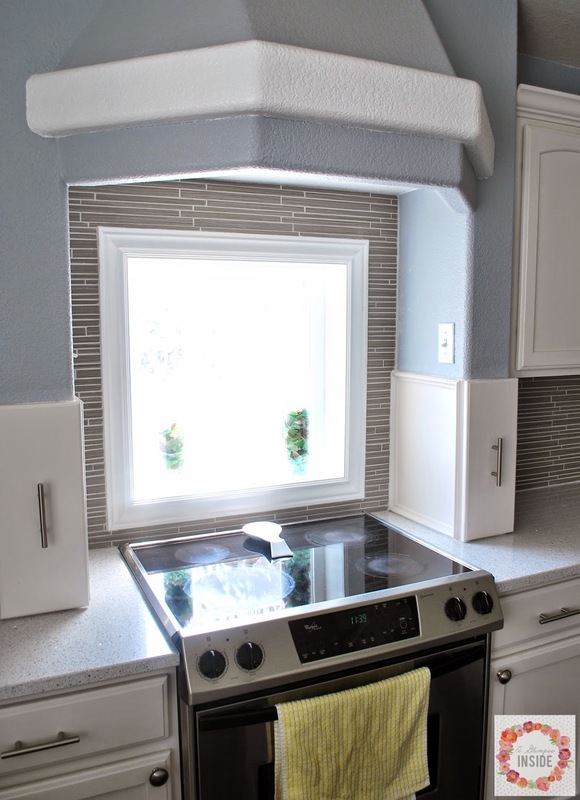 Once the counters were in, the great back splash tile debate was on! We looked everywhere! I knew what I wanted but unfortunately, most of it wasn't in our budget. We found this tile at a store in town called, Tile 4 Less, and we both liked it so we brought home a sample. Travis was sold on it, I was not. 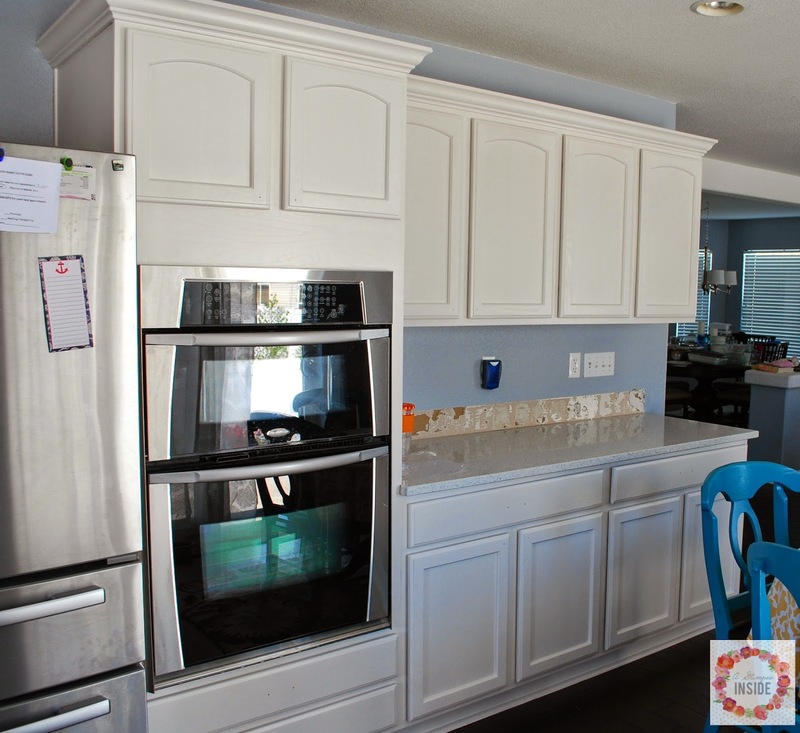 I wanted to add a TOUCH of color or shine or something since our counters and cabinets were white now so I kept looking. I will blame indecisiveness from being pregnant with Miss S during all this. Finally after not being satisfied with anything out there, I told Travis to go buy it. The tiles got applied, and then this sat, ungrouted until right after Miss S was born and my dad help Travis bust it out one day. Truthfully, I like it but I am still NOT in love with it. And to make matters worse, I am now finding stuff that I love and what I was looking for that I would have loved to do. All well... it isn't our forever home, right?! And once the back splash was complete it was back to waiting on those darn cabinets by the stove to be complete. And here is the final result of those cabinets. I love having my spices right by the stove because before they were way in an end cabinet, way to the right of our stove. I had to wait for Travis to build the box and shelves and then the drawer fronts. We bought drawer gliders (no clue what they are called) and mounted them on the top and bottom of the boxes and shelve boxes as well. Placed the drawer fronts on, painted them the same color as the cabinets, and then used some extra drawer handles we had left and mounted them vertical. And finally the kitchen was complete!!! 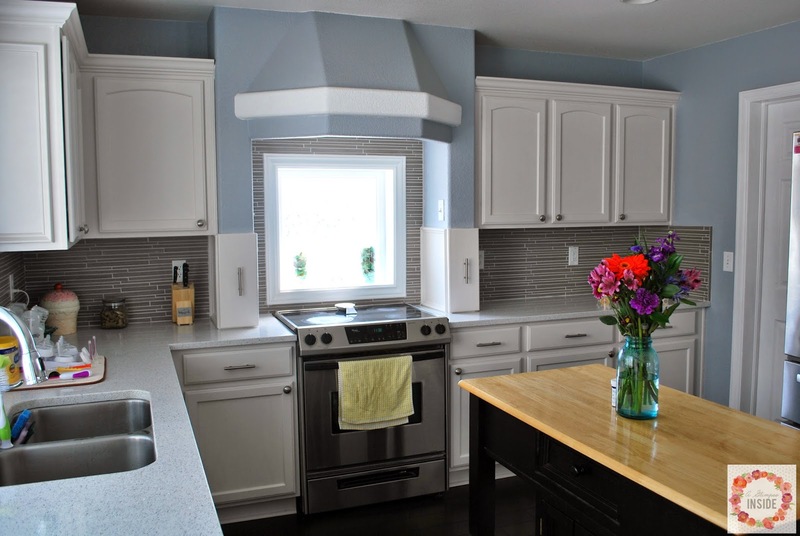 I love the way the cabinets look with the crown and the molding on them. So happy we did that! It is so much brighter and feels so clean now! 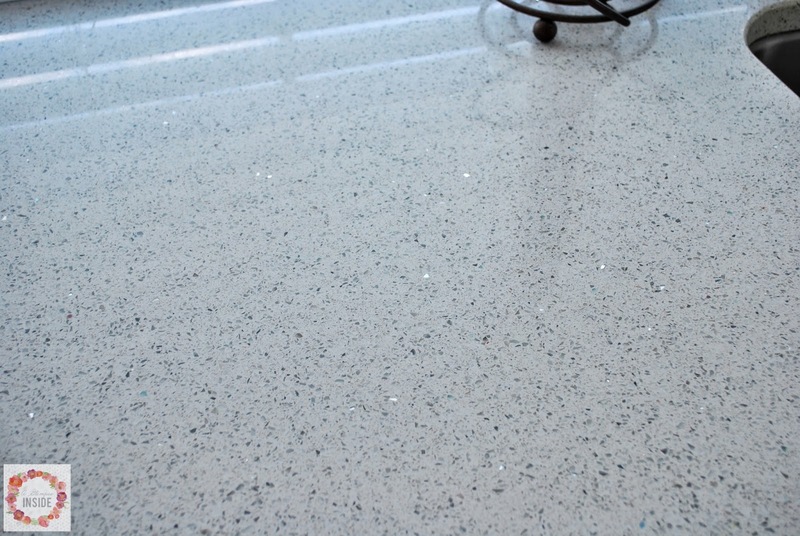 The Quartz counters have been fabulous! And I am in LOVE with our under mount sink! 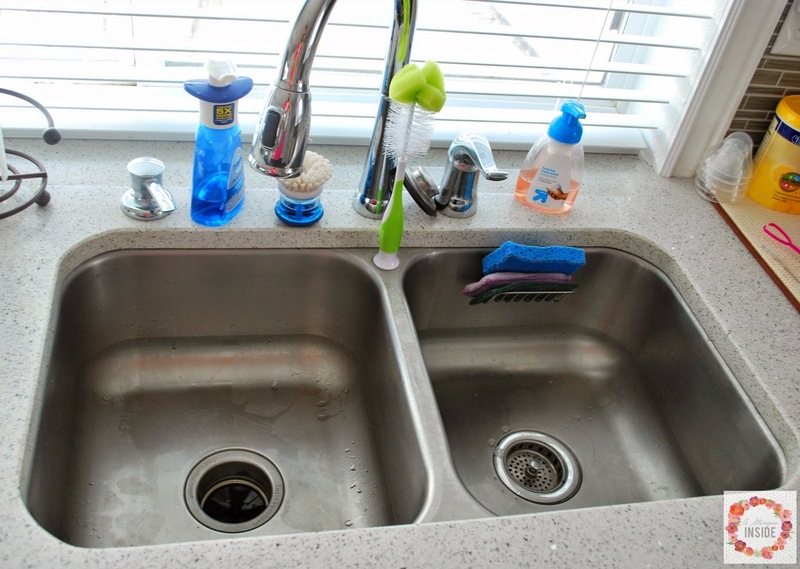 Being able to wipe things off the counters right into the sink is so wonderful! 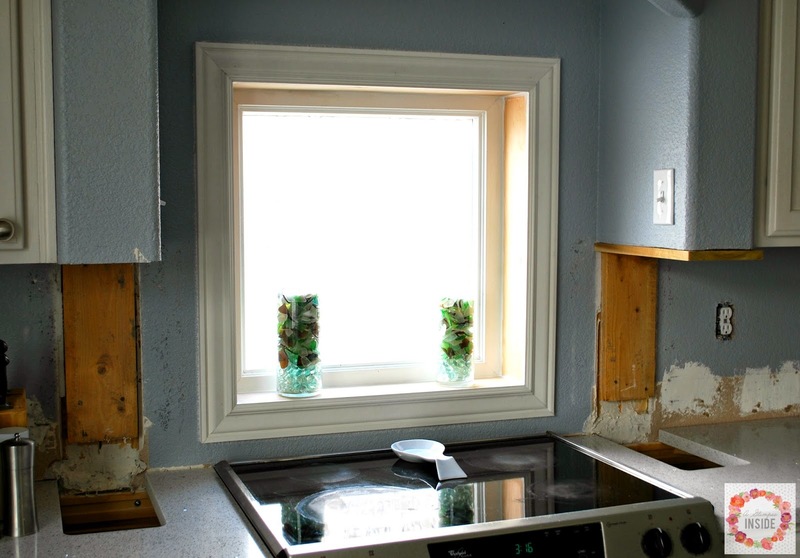 As you can see, we even tiled all around the window behind the stove as well to tie that random window in with the rest of the walls. Some of you may be questioning why we went white, especially with having two little ones, or wondering how they have held up. I just wanted something bright since our floors were so dark. 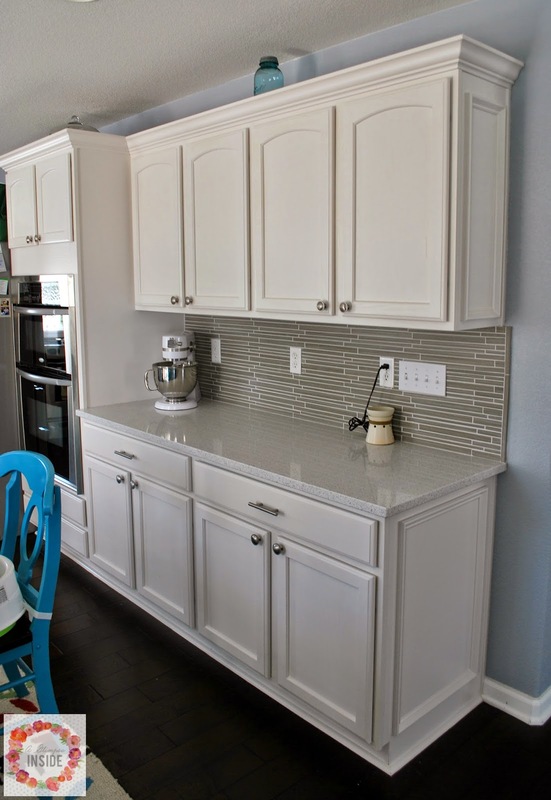 I know white isn't for everyone but it has made such a difference in our house to have these bright, white cabinets. And since it has been a full year that we've had these, they have held up great!! No chipped paint, they wipe right clean if something gets on them, and shockingly, I don't see little dirty finger prints on them. All of the last few pics in this post were just taken so you can see that they have held up great! I LOVE our new kitchen and am so happy it is finally complete. Well, there is one last project that needs to be done but it isn't major... our island will be getting a makeover as well. WoW! I have some serious Kitchen envy right now!!! It looks amazing! Enjoy! Everything looks absolutely gorgeous! 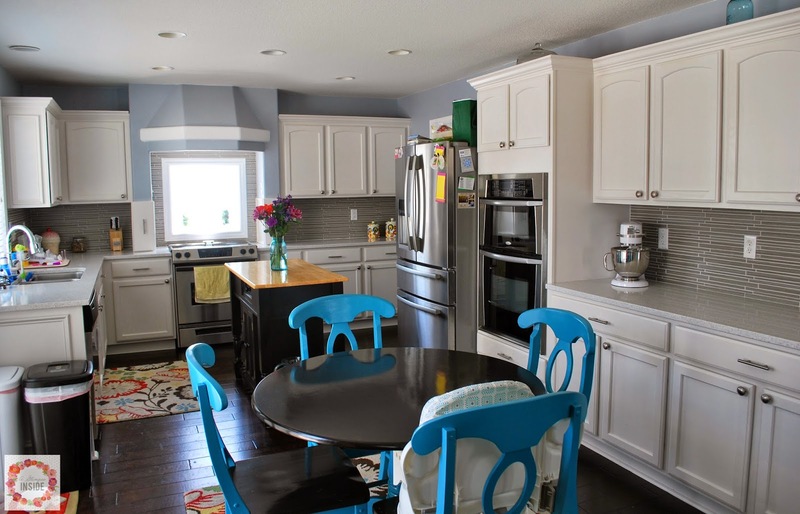 I love your back splash tile and all the fun pops of color. What is the wall color? Beautiful. Pretty! Enjoy! A finished kitchen is a wonderful feeling! Looks Great! 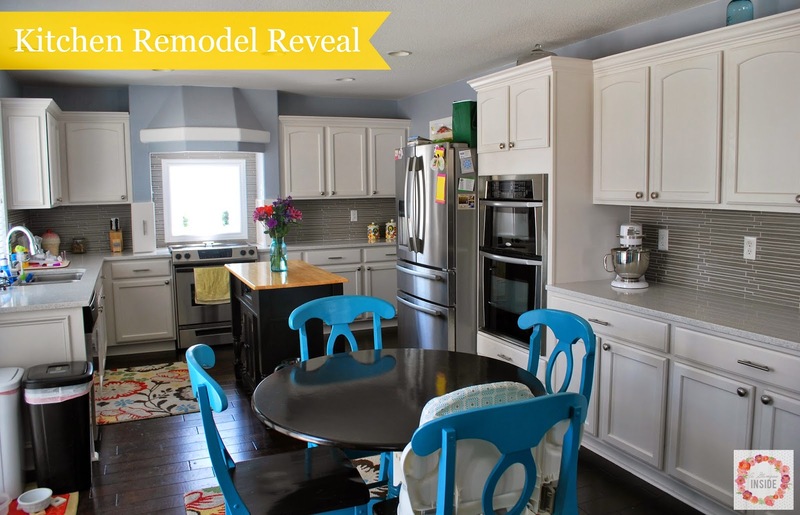 What a little paint and new counter tops can do to change a room! I love your kitchen! 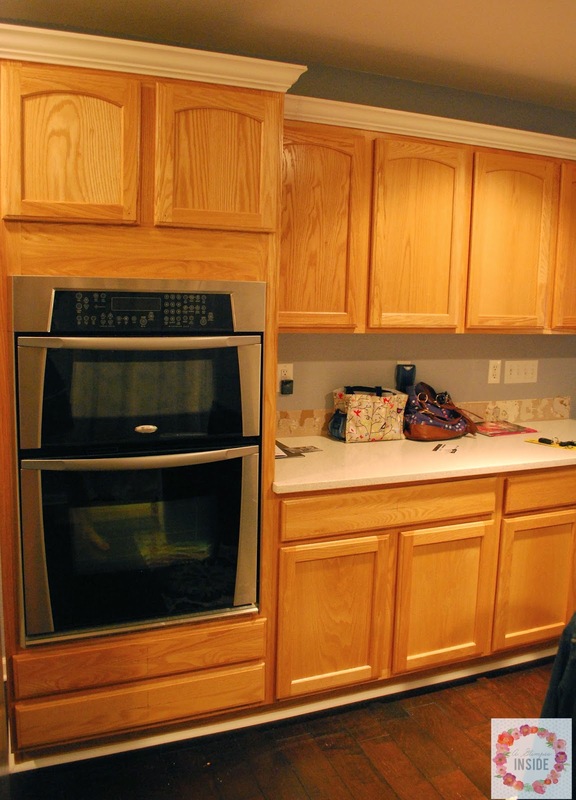 We also had those orange oak cabinets in our kitchen and I painted them an off white about 10 years ago. They have held up very well, though I just touched them up this past month because we are going to be selling our house soon. 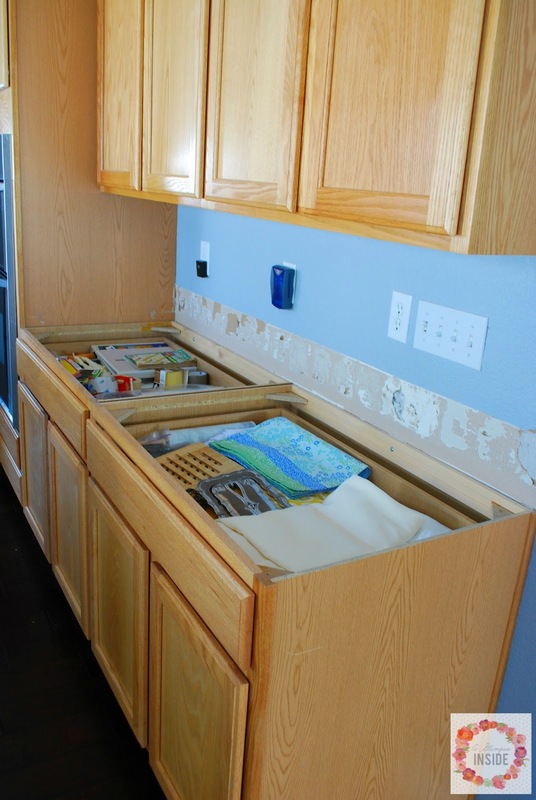 Those spice drawers were a wonderful fix to a serious problem! Now your spices are right where you need them. Can't wait to see what you do to your island. Have a great evening! 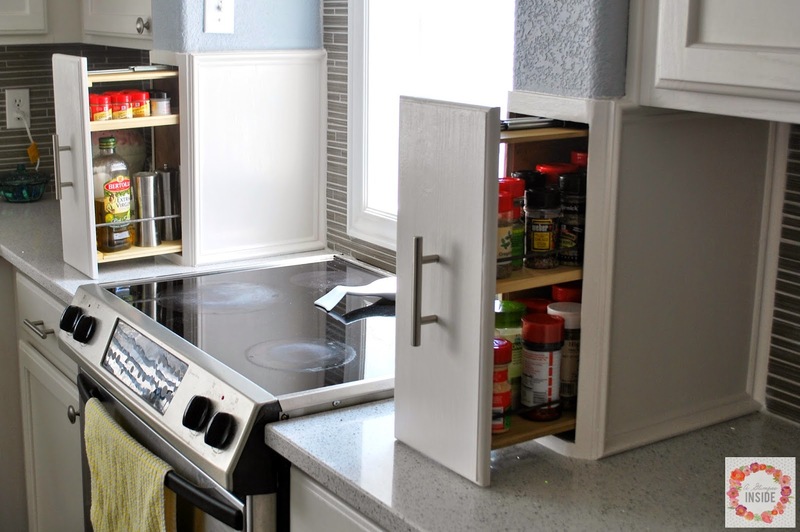 The spice racks are super awesome! And great job adding the different structural pieces to add "depth" to the space! Spectacular job! 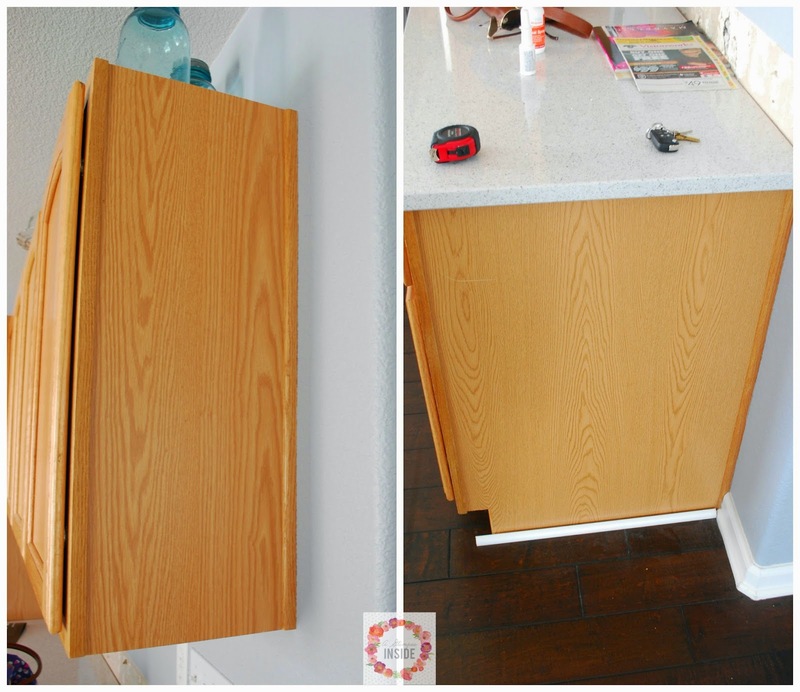 Love that you were able to use odd parts of your kitchen into something so useful and perfect for the space. Love it all!! 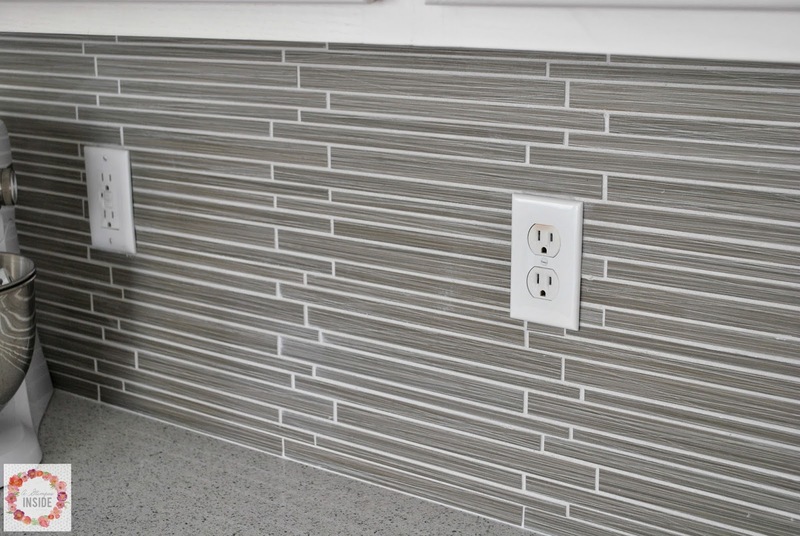 that tile is AWESOME! 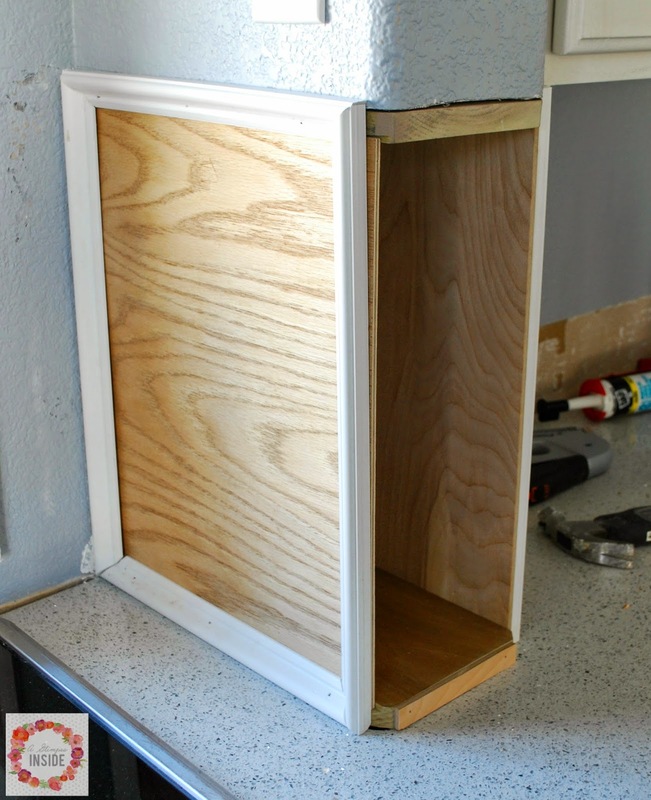 i love those little built ins you added, and the molding up top to beef up the cabinets. enjoy your new space!